A new school year is approaching. You have selected and purchased the materials you chose for the year. Now, if you are like me, these materials are in a pile or two on a flat surface or on a bookshelf, waiting. Now what? Does seeing the new materials make you smile or feel panic? Are you excited to begin planning or unsure of where to start in preparing for the next school year? 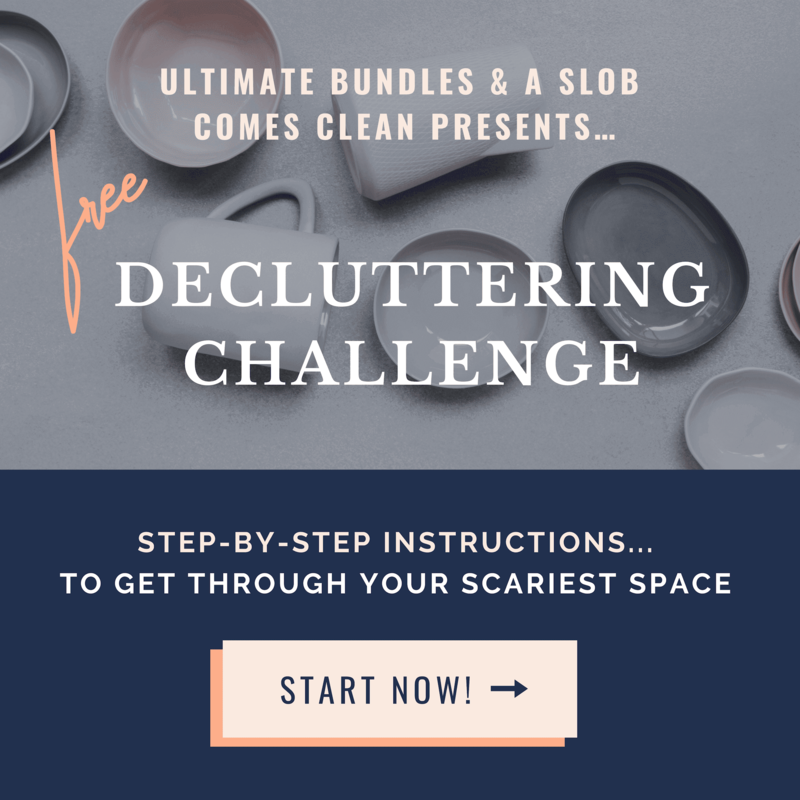 Following a simple 5 step process, you can get everything organized and ready without a big headache! 1. Plan out your calendar for the year. Decide when you will have your first day of school, your days off, and your last day of school. Having this in place ahead of time saves the headache of planning (or misplanning) during the year. Decide the extracurricular activities you want to do and schedule them in if possible. Or, just keep a list of your plans with your calendar so you remember. I print off a July-August calendar on a single sheet of paper. 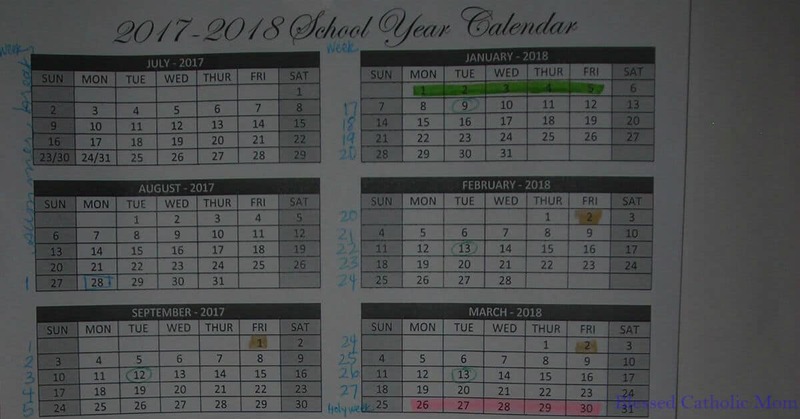 I number our school weeks and use a highlighter to mark our days off, birthdays, and events (like monthly park day). This is posted on the wall in our school area where our kids and I can easily see it. It really helps to have all the information all on one page and easily accessible. 2. Separate materials for each child. Sort out everything for each child. Create one pile for each child’s materials: all of the books, kits, videos, and materials that you have. Include answer keys and support materials as well. Having everything in one place is helpful so you can see what you actually have. 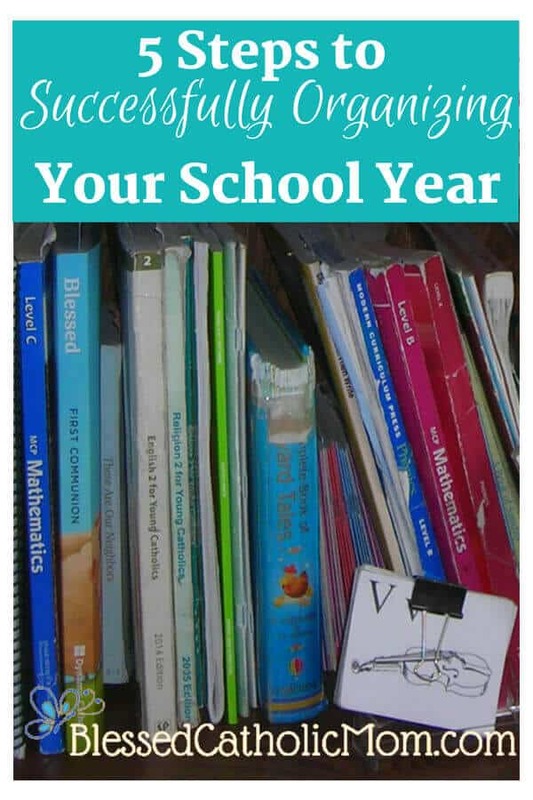 Double check that you have everything you need for each child for the year. If there is something more you need get, write it down so you can keep track. Decide where you will keep everything. 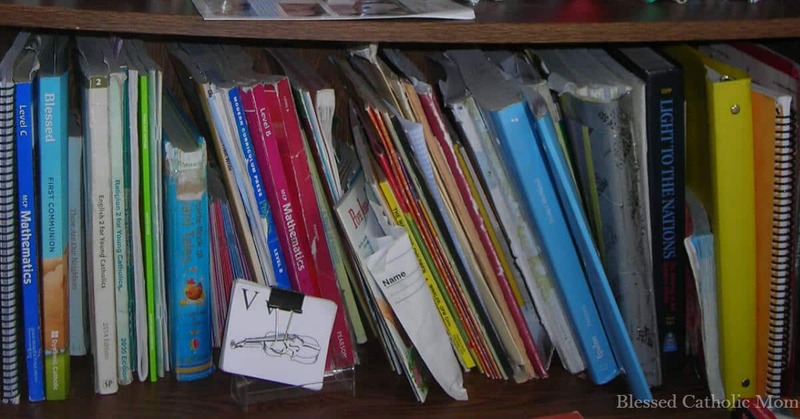 We have a bookshelf in the school area of our home and each child has a full shelf or half of a shelf for his or her school materials. I take off what is no longer needed to make room for the new materials we will use. One of my friends uses a container for each child’s materials. These containers fit on their bookshelf. There is a little bookshelf by my desk where I keep the lesson plans, answer keys, and support materials for all of the grades my kids are currently in. I keep them there so they are easily accessible to me and easy to get to when I need them. 3. Plan out the curriculum for the year. More planning? Yes! More planning. Now that you have the materials you will use for the next school year and know your calendar, creating lesson plans is the next step. Look through the materials you have. Some books geared to homeschoolers have a few pages in the front of the book dedicated to explaining how to use them and suggestions for how to break up the lessons over the school year. Some books have the lessons broken down already. For example, week 1, day 1; week 1, day 2, etc. so the planning is already done for you. Create lesson plans (if needed). If you need to create the lesson plans yourself, never fear. This is not as hard as it may seem. 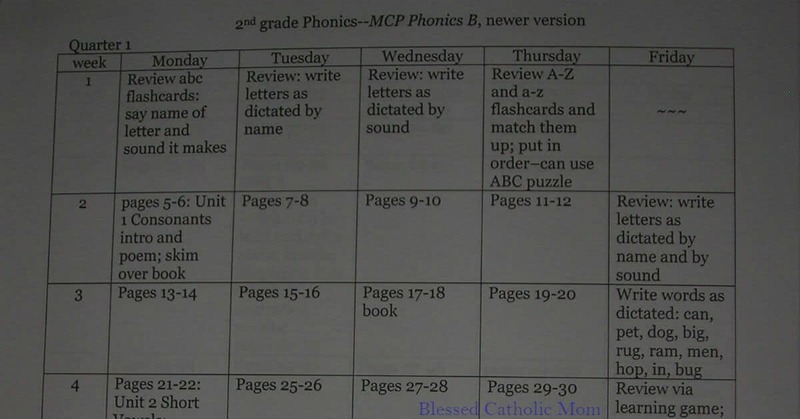 Let’s say you created your calendar with 36 weeks in your school year and your daughter’s phonics book has is 200 pages. Divide 200 by 36 and you get 5.5. This is how many pages you need to get through each week to complete the text by the end of the year. If she completes two pages a day, that equals three days of textbook work each week. You can have one day to review and a day off each week, or plan two review days each week. If you need to slow down the pace to devote more time to certain concepts, you can do that easily. I like to have a plan I can look at and having it written out or typed out helps me to see what our year will approximately look like. The nice thing about younger children using what older children did is that the plans are done already! Just pull them out and you are ready. Side note: If you need to take more time going through the material of a subject, that is fine. Some kids breeze through something and others need more time. If that phonics ends up taking longer than you have days in your school year, you can continue in the summer, pick it up again next year, or just call it good and move onto the next level of the book next year if it will cover what you did not get to this year. Double check first. Having a plan in place, even if you end up not sticking to it completely, gives you a guide to follow during the year which means less stress. If you just spend thirty minutes a few days a week planning, you will get a lot done. For me, the easiest way to organize lesson plans is to have one binder per grade. I use labeled dividers to separate each subject’s lesson plans. I keep all the binders on a shelf together. This way, I won’t be searching all over to find what I need when I need it. 5. Decide how you will use these plans during the school year. Over the years, I have used our lesson plans in two different ways. I used to get out the binder of lesson plans and write the next week’s plans in a planner for each child. This way, the entire week was in front of me to easily refer to each day. After we had a few children in school, I typed up the plans on the computer. I created a weekly lesson plan grid for each child. It was easy to cut and paste the information for the next week into this grid and print it out. This was helpful for the kids as they became more independent; they could look at their plans for the week and know what to do. The older ones could get started on their work while I worked with the younger ones. Some homeschoolers do not write out the plans for the week ahead. Rather, as they go through their day they write out what work was completed that each day. Others use a simple spiral notebook and write each night what the child needs to accomplish the next day. With these approaches, you are just looking at one day at a time. There are many different ways you can use your lesson plans during the year. There is no right or wrong way to do this. Actually, that is not true; the right way is the way that works for you and your family. Having lesson plans created and organized before you begin your next school year is a tremendous help. 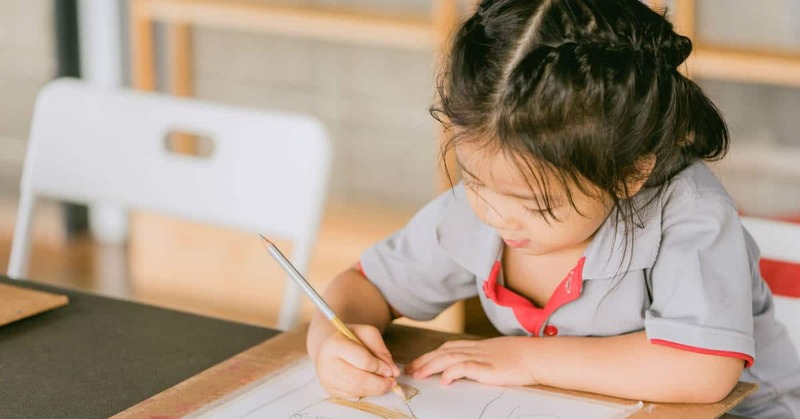 When you are prepared, you can enjoy the process of schooling more since you are not trying to get organized or trying to figure out what to do during school hours. Planning ahead brings peace. Remember, planning may take some time, so pace yourself. Make a plan to work some each day or each week and you will get it done. Following these 5 simple steps will help you to be ready to tackle your next school year with peace and a plan.